Cape Town – POLYCO, the non-profit Polyolefin Recycling Company, has just released a series of five informative and fun and YouTube-style videos to explain the importance of plastics recycling, how to recycle, what not to recycle, and the various different products that recycled plastics get made into. 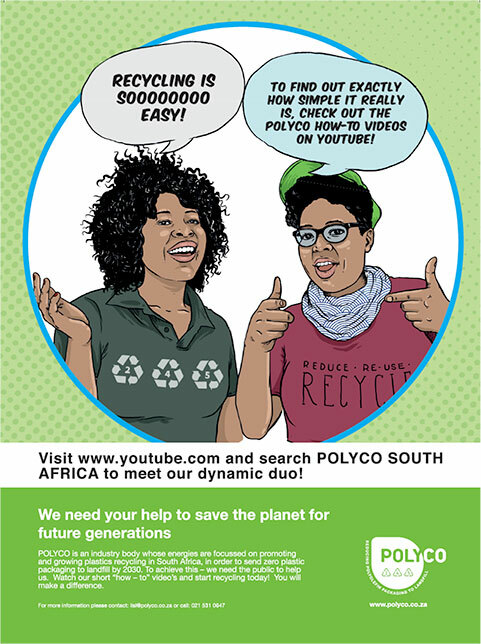 According to POLYCO Chief Executive Officer, Mandy Naudé, each video is only approximately 3 minutes in length and features the dynamic and funny sister duo, Nolo and Gee, taking viewers through the simple facts. “Unfortunately, many people don’t recycle and there is still a lack of understanding about recycling that exists in the marketplace. We have also found that many consumers are willing to separate their waste, but are unsure of what to do with the recyclables if there is no kerb-side collection system in place in their suburbs. Our videos aim to show that recycling is fun and easy to do, and is needed for the sustainable future”, Mandy explains. In addition to funny banter and dialogue, the videos also use animations and graphics to make the learning and viewing experience more entertaining. “It was important for us to appeal to a wide audience and to be able to show these videos in a variety of different contexts,” Mandy explains. “The two sisters are polar opposites of each other, but in so doing appeal to and help educate a wide ranging audience – from school children and young adults, to housewives and even waste collectors who need to learn how more about the different kinds of plastics,” she explains. The video series will officially be launched on Youtube in September as part of the plastics industry’s Clean-Up and Recycle SA month, as well as with advertisements in selected in-flight magazines and consumer publications driving clicks to the online videos. Concludes Mandy: “We believe that we can change recycling behaviours in SA and have a positive impact on the future of the recycling industry by educating the leaders of tomorrow. For this reason, we made the message fun and easy to grasp, ensuring that it has longevity for the years to come”.